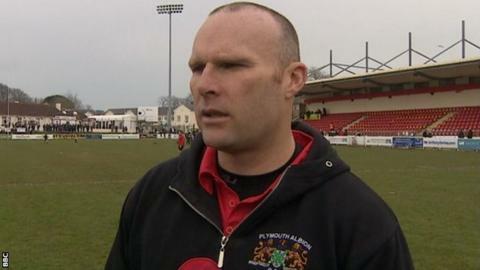 Plymouth Albion head coach James Shanahan admitted the pressure is already mounting on his injury-hit side after back-to-back Championship losses. Defeats at Doncaster and at home by Nottingham have yielded one bonus point and they sit 10th in the table. "If we don't win this weekend at Rotherham then Bedford becomes a must win," Shanahan told BBC Sport. "Although it's early, the pressure is on already - if we don't put some wins together soon it'll become a dogfight." The Australian recruit has arrived at Brickfields from Sydney-based side Randwick and is in line to make his debut this weekend in Yorkshire. Albion were already without the services of Declan Cusack and Elliot Clements-Hill, and the backline has been hit further with the news that Mark Kohler will be out for six to eight weeks following an ankle operation, while fellow winger Peter Homan is awaiting knee scan results. "It's by no means doom and gloom, but we've had some rough luck with injuries," Shanahan added. "I can't control what's gone but I can control how we go forward and we know we can match anyone in this division if we cut out our errors. "We were a bit down after the Nottingham game, but there's been a good buzz in training and the door is open for other guys to put their hands up and show why they should be starting."